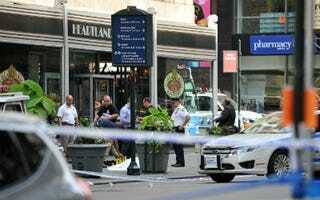 In a piece for Ebony, The Root's contributing editor Edward Wyckoff Williams says that the recent shooting outside the Empire State Building reminds us why the policy is a "big, racist fail." When it comes to the nation's misguided approach to gun control — or lack thereof — New York City Mayor Michael Bloomberg is a hypocrite. Following a May report by the New York Civil Liberties Union (NYCLU) — which revealed that stop-and-frisk of New York City residents had increased by 600 percent since Bloomberg took office, and was focused almost exclusively on young African-American and Hispanic males — Bloomberg defended the practice, despite the fact that it amounts to defacto racial profiling. The data showed that 87 percent of those stopped in 2011 were Black and Latino males and according to the report "the number of stops of young Black men last year actually exceeded the total number of young Black men in the city (168,126 as compared to 158,406)." Whites, who represent 33 percent of the City's population, accounted for only 9% of those stopped. What is even more compelling, and the critical point being ignored by Bloomberg's administration, is the fact that white Americans in general — and white New York City residents in particular — are twice as likely to carry a gun than Blacks. The NYCLU reported, "a weapon was found in only 1.8 percent of Blacks and Latinos frisked, as compared to a weapon being found in 3.8 percent of Whites frisked."